Life at Stamping Details: A Touch of Class with Ellie Carrel August 4th! A Touch of Class with Ellie Carrel August 4th! A Touch of Class is both simple and elegant, with just enough bold pattern to give this collection a rich and sophisticated look. All occasion cards sure to please anyone who receives one! Class cards are pre-stamped to save time and all papers and supplies are furnished. Students will need to bring only scissors to class. All adhesives, glue and markers, Tombow and/or Copic, are supplied for use in class. Students also receive a printed instruction/measurement sheet of all projects along with an itemized list of papers needed to complete those projects. Cards and instructions/measurement sheets are copyrighted and for personal use only. Ellie Carrel, now a resident of California taught successfully for several years for Linda Bradbury and her sister, Linel Mehus. Linda and Linel owned and operated The Avenue in White Bear Lake, Minnesota, when Ellie was living in Wisconsin. Ellie has a professional, warm, inviting, and welcoming style to her teaching. And rightly so, she has recently retired from teaching kindergarten for the past 35+ years! 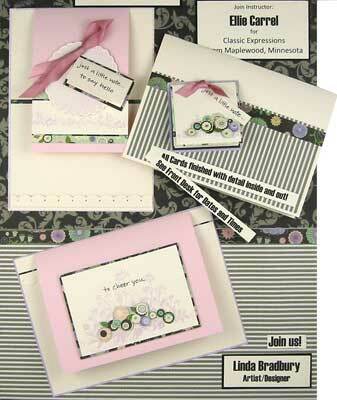 To learn more about Linda Bradbury and Classic Expressions, visit the Classic Expressions website. $29. Includes all class materials. Student Cancellation: A refund will be available with 48-hour notice of cancellation. This gives the instructor enough time to modify the preparation kits accordingly. No refund when there is less than 48-hour notification; student will receive the class kit/instructor notes if applicable. NEW PRODUCT ALERT: Tim Holtz Sizzix Dies! So Cal Shop Hop 2012! So Cal Shop Hop off to a GREAT Start! Caroly Murphy Classes on Saturday July 28th!! New GRAPHIC 45 IN STOCK! Summer Fun Class with Jenny Griffiths July 27th! Butterflies are FLYING! So Cal Shop Hop 2012! Sizzix Fun Buffet with Pat - July 23! Divide and Conquer: Mixed Media Canvas! Chris Cozen Class - Saturday July 21st! Zentangle Basics with Suzanne is back July 14th! It's Triore with Candy on Saturday, July 14th! Michael Strong is back with a Passage to India! New Product Alert: Great Impressions Stamps! Stamping Details has a Zentangle Club! New Product Alert: Steampunk by Janlynn Corp! Old Curiosity Shop Suitcase Album this Saturday! July Catalog of the Month - Impression Obsession!